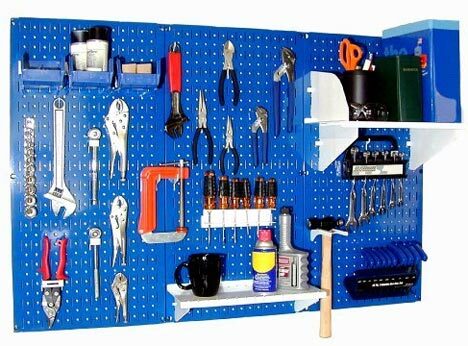 There was a time when you could walk into just about any workshop or garage in the US and find some pegboard hanging the wall. But now, for some reason it doesn't seem to be a popular choice. I guess people have turned to drawers and cabinets for there storage needs. For those of you that still like the pegboard but are looking for something a bit cleaner, take a look at systems offered by Wall Control. Wall Control offers a complete line of metal pegboards and kits for any number of applications. You can get the board in your choice of galvanized or power coated metal and because it uses standard peg spacing, you can use hooks and accessories you already own. The use of 20 Gauge Steel in a board has a number of advantages, the first being a board that is 10 times stronger then conventional pegboard; other benefits include being easier to clean and being magnetic. Typical pegboards can not be mounted onto flat surfaces such as drywall, because of the lack of clearance for the peg hooks, but Wall Control built their boards with a flange on all sides to make mounting on flat surfaces possible. I have not used the Wall Control system for myself, but it looks like a solid system. Considering that it is made of 20 gauge steel and made in the USA, a price of around $40 for two 16” x 32” doesn't sound that bad. Of course if you want more, you can always buy one of their kits that includes hooks and other accessories.